The history of the First Baptist Church in Newton (American Baptist) reaches back to July 5, 1780 when it was founded just west of our current building on the banks of Baptist Pond, or what is now Crystal Lake. The first Baptists in America migrated from England in 1638, and settled in Rhode Island. They were the earliest settlers in New England to insist on religious freedom for all people. Today, our church remains connected to the historic American Baptist convictions of freedom of conscience and the freedom of each member to grow in his/her direct relationship with God, without creed or doctrine. Though we maintain close ties with the American Baptist Churches, USA, all church matters rest locally with our members, who hire the ministerial staff, elect officers and determine policy. Listed in the National Register of Historic Places, the building was designed by the young Boston architect John Lyman Faxon (1851-1918) and it was completed in 1888. It was completed in the Late Victorian era, one of the most significant periods of American architecture now recognized as unique and indigenous to the United States. The church has since resisted temptations of succeeding generations to alter the building to more current styles, so it remains a fine, intact, handsome example of uniquely American building. The building exhibits fine examples of late 19th Century American stained glass, unique in that they were all in place at the completion of the building. Presumably mostly the work of Donald McDonald, a leading Boston studio, they are significant in utilizing then-new opalescent glass and are largely influenced by the work of LaFarge and Tiffany. The tower was given in memory of Reverend Samuel F. Smith, minister of this church from 1842 to 1854 and author of "America." In 1932, on the 100th anniversary of the writing of "America," the tower was rededicated the "America" Tower. The bell tower contains an 11-bell chime cast by Meneely Bell Co. of West Troy, NY, and installed in 1899. The organ derives from Hook-Hastings Opus #1906, installed new in the Chancel in 1901. In 1985, after several earlier alterations, portions of Opus 483 were added to the newly-purchased E. and G. G. Hook Opus 371, built in 1865 and formerly installed in the Mt. 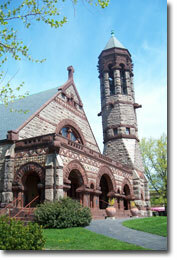 Pleasant Unitarian Church in Roxbury. The work was done by Andover Organ Company. The present organ has 1,544 pipes in 27 ranks and is direct mechanical (“tracker”) action. 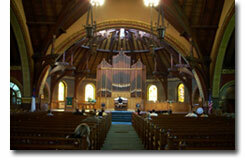 It is well suited to leading congregational song as well as performing a wide variety of solo repertoire. when the present building was built, the organ from the previous building (Opus #483) was relocated to the new, located in the present Communion Room; by 1901, an entirely new organ (Opus #1906) was bought, by then located in the center of the Chancel, and it's that one from which some pipework was taken for the present organ.